Members of the first classes to receive the Smith Alumnae Quarterly in 1909 would hardly recognize the world that is represented in the magazine today. Those women—by and large the privileged daughters of America’s elite—were among the first wave of women to receive a higher education. They still didn’t have the vote, though, and they probably could not imagine a Smith College as diverse in age, class, race and country of origin as is represented in the magazine today. It’s a shame they can’t come visit our world. 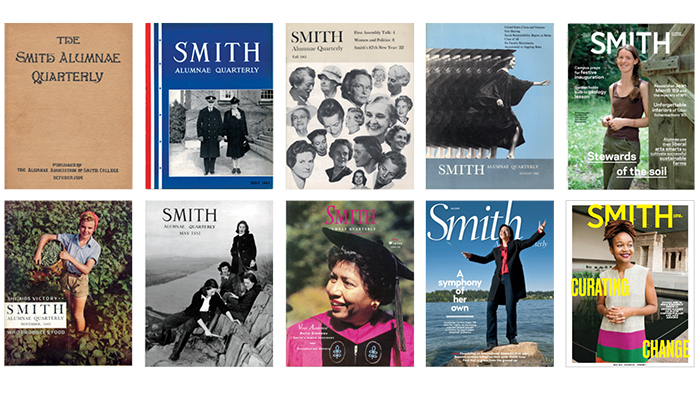 But we can easily visit theirs now that every issue of the Smith Alumnae Quarterly—from 1909 to the one you’re reading right now—is available via digital link. For the past two years, the SAQ staff has been working with Cenveo Publisher Services to scan and digitize every page of every volume of the Quarterly. Not only are the pages easily accessible, but the entire collection is searchable. “We’re proud to put this invaluable history at the fingertips of our readers,” said Laurie Fenlason, vice president for public affairs and strategic initiatives. The new interactive digital archive takes the place of a limited, PDF-based online flipbook, in which readers could see the magazine online but couldn’t search across issues. Also, the PDF flipbooks only went back to 2005. To access the new archive, go to saqonline.smith.edu. Once there, you’ll find instructions for how to open the archive, search for names and keywords, create PDFs, print pages, post selections on social media and send pages and entire issues via email. The archive is a compelling place to get lost in time. The custom-built archive has a few Smith-centric idiosyncrasies. For instance, what was “Mary (Jones) Johnson ’25” in 1935 became “Mary Jones Johnson ’25” a few decades later; if the full name is searched, it must be searched precisely. A tips page will give you some ideas about how to complete a successful search. The archive is a compelling place to get lost in time. Scroll through the history contained in 107 years’ worth of Smith Alumnae Quarterly issues and you’ll get a glimpse of the lives that women led, the preoccupations of Smith students and faculty, the concerns and advice of alumnae as they moved into careers and the effects on and contributions of women during two world wars. Reagan, Nancy Davis ’43 wrote to class notes in 1945 to say she was working at Marshall Field’s in Chicago and as a nurses’ aide at the Serviceman’s Center. In 1953, Barbara Pierce Bush ’47 reports the birth of her second son, John— though you may know him as Jeb.